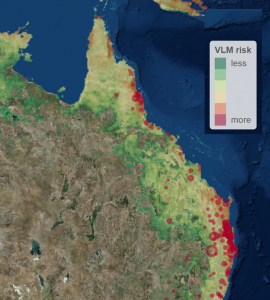 VLM risk in March compared to the value of nursery crop production (red circles, where size denotes relative production value) – cesar pty ltd.
Project member, Dr James Maino, has developed a new interactive web tool, to map key areas across Australia that are most at risk for the entrance of this pest. The tool uses weather conditions to predict potential VLM activity, so that you can explore expected population growth at any time of the year and compare how the predictions line up with regional production values of ‘at risk’ crops. Combining weather data and insect data, in its simplest form this tool simulates a biologically accurate fly, and puts it in different climates to see how quickly it grows. Dr Maino said the tool was an exciting development for the industry. “This pest forecasting tool will help Australian biosecurity by highlighting high risk areas and seasons for surveillance prioritisation. “It will also help Australian growers by highlighting the regions, crops, and seasons that are most at risk from vegetable leafminer impacts if it were to establish here,” Dr Maino said. This tool is already being used within the project to direct awareness raising activities and give greatest focus to the highest risk areas. Gaining feedback on this tool is really important! Check out the tool, and if you have any comments about its functionality or ideas for how it could be more useful – please get in touch. Contact Dr Elia Pirtle from cesar at: epirtle@cesaraustralia.com or 0414143456. The strategic levy investment project RD&E program for control, eradication and preparedness for Vegetable leafminer (MT16004) is a part of the Hort Innovation Vegetable and Nursery Funds. This project has been funded by Hort Innovation, using the vegetable and nursery research and development levies and contributions from the Australian Government. Hort Innovation is the grower-owned, not-for-profit research and development corporation for Australian horticulture.